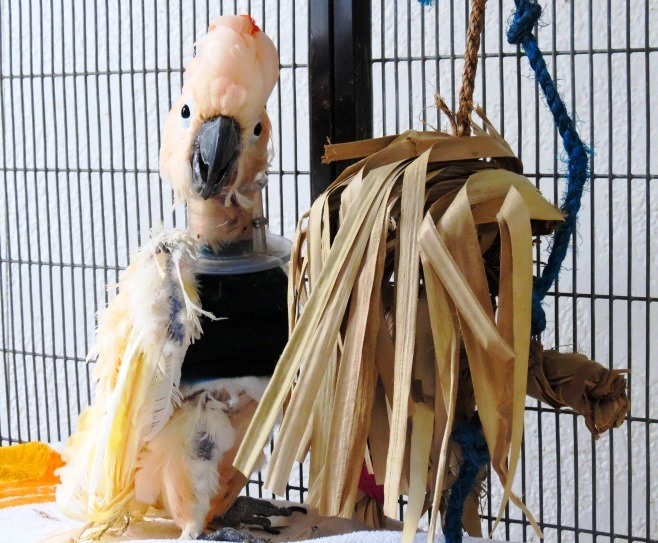 BJ is one of a number of parrots who give meaning to our philosophy of “Sanctuary.” His survival against so many odds and his overt happiness in recent years has been an inspiration to us. It was a solemn time when BJ unexpectedly passed away during the late morning hours of October 3rd. There’s not a single person who has met BJ that doesn’t hold a special place in their heart for him, for his is a very special story. A story worth telling again as a reminder of the birds that continue to suffer from poor care and neglect when they are no longer wanted or loved. BJ came to us in 1999 after being rescued from a life of true neglect. He spent 17 years shut up in a cage large enough for a cockatiel. He arrived in grave condition and his eyes were “dead”, like he had lost all hope. He suffered leg and spine deformities from living in such cramped quarters and he was significantly undersized as a result of malnutrition and starvation. For lack of toys and other entertainment, he had taken to mutilating himself and had a gaping wound on his chest. He was scared to death of anyone who came near him. But of course, we weren’t ready to give up on him. He was treated by our vet – he received intense love and care to heal his wounds. Because his feet were atrophied and he could not perch, he was provided a special cage with ample space, lined with towels and some flat, low boards to stand on and climb. For a very long time, BJ would shiver with terror whenever anyone approached his cage. We talked to him sweet and low, we sang lullabies to him, we provided the care he needed, cleaning his cage, cleaning his chest wound – changing the dressing to keep him from working on it. We always respected his space. Somewhere in his poor injured heart, BJ began to trust. He started to allow some people to get closer, no longer trembling in abject fear. He started to dance and play, and most amazing of all, he actually stepped up to his favorite people. His eyes beamed with happiness and “life”. But BJ remained a mutilator, so he was given special sweaters and collars to protect his fragile skin from his habitual desire to harm himself. His mood would lighten when he got a new sweater…as if he felt so handsome! A joyous development for all of us was when he found a lasting lady friend. Pele, another of our disabled Moluccan Cockatoos lost her longtime friend and we introduced her to BJ. Their connection was instant and they lived happily in BJ’s retrofitted cage together the last four years. Their bond was deep – they found contentment in each other’s company. BJ embodied the forgiveness and resilience of a true hero…he was our HERO. BJ’s life would have ended tragically years ago, had he not been rescued. He was given a chance, a hope, to heal and find a place for his spirit to shine. Our deepest gratitude is given to BJ’s rescuers, the dedicated individuals who provided his care, to his gracious sponsor for supporting his care and to his friend Pele for making him whole. BJ left a lasting impression and he will remain forever in our hearts. It is our practice to have a necropsy performed when an Oasis bird passes. Nothing of significance was found on BJ’s initial exam. We are awaiting final pathology results to establish his cause of death. Our work is only possible because of the support of individuals like you. YOU can help the many birds who have survived the odds and deserve the happiness that BJ found. Wow Haley is a hoot I never knew they could do such things!!! My daughter and I have a deep love for birds we must visit the sanctuary soon! !